Coverings, the largest global tile & stone exhibition in North America, is seeking the finest expertise in craftsmanship, creativity and innovative use of materials in tile and stone projects for its 2016 Coverings Installation & Design (CID) Awards. The CID Awards, sponsored by TileLetter and Contemporary Stone & Tile Design, honor projects that showcase exceptionally creative designs and demonstrate technical mastery in the use of tile and stone in residential, commercial, international and sustainable projects. The free submission process is open to architects, designers, builders, contractors, distributors, retailers, installers and other professionals who embody excellence in design and installation skills. New to the CID Awards program for 2016 is the “Scouting Shot” category, which offers outstanding projects with amateur photography the opportunity to be professionally photographed. The winning project in this category will receive a complimentary professional photo shoot prior to the show. The professional photos will be on display at the Opening Night Celebration. Coverings will honor all winning projects on Monday, April 18, at the CID Awards & Opening Night Celebration. The celebration will include a presentation of the winning projects during an interactive showcase and a cocktail reception – offering attendees the opportunity to meet the professionals behind the industry-leading projects. 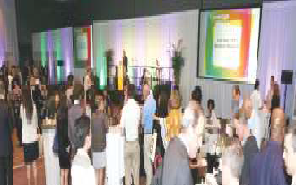 The CID Awards & Opening Night Celebration is free and open to all attendees. Installers and designers of the Grand Prize winning projects will each receive $2,000 and a one-night hotel stay in Chicago. Additional cash prizes will be awarded. All winners must be able to attend the CID Awards & Opening Night Celebration. If unable to attend, the project will be disqualified with a new winner awarded – with the exception of international projects. Multiple entries are accepted and encouraged, and there is no fee to enter. Entrants should submit through Coverings’ online portal. For more details on the program and to submit a project, go to coverings.com/CID.